Donovan Osborne made his return to the majors in 2004, one of many such returns in his career, and his new manager Joe Torre explained to The New York Times the Yankee's interest in the veteran. "He's got a lot of courage; he doesn't scare easily," Torre, who earlier managed Osborne with the Cardinals, told The Times that March. "He's got arm strength, but we're basically relying on his know-how here, his ability to pitch, not overpower people." Osborne used his know-how to see the majors in nine seasons. He also used it to come back from multiple injuries and one particularly bad outing in one of the worst spots - Game 7 of the National League Championship Series. Osborne's career began in 1990, taken by the Cardinals in the first round of the draft out of UNLV. He is also sometimes credited with a misspelling in his first name, Donavan Osborne. Osborne started with the Cardinals at short-season Hamilton and single-A Savannah. He made AA Arkansas in 1991 and then the majors in St. Louis in 1992. Osborne got into 34 games, starting 29, that rookie year. He went 11-9, with a 3.77 ERA and came in fifth in the Rookie of the Year voting. He went eight innings in a May game, giving up four hits and no runs. He returned to St. Louis for 1993, starting 26, going 10-6. He then lost 1994 to injury and got into 19 starts in 1995. Osborne returned to form for 1996, helping the Cardinals to the NLCS with a 13-9 record and a 3.53 ERA. He even had success at the plate, hitting a grand slam in a September win. In October, Tony LaRussa showed enough confidence in Osborne to hand him the ball in Game 7 of the NLCS, a trip to the World Series on the line. Osborne lasted just two outs, giving up six earned as the Braves moved on. "It was no fun for me and I felt I let the team down," Osborne told The Associated Press the next spring. "It happens. It's happened to me my whole career. Either I give it up or I'm good, and you're going to give it up a few times." 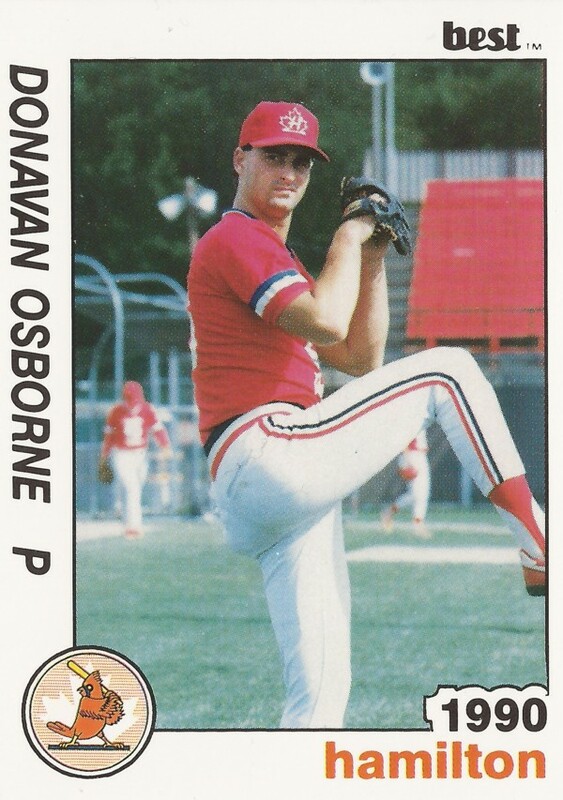 Osborne's 1996 season and his 30 starts turned out his last extended time on a major league mound. But he continued playing. He got 14 starts in each of 1997 and 1998, missing time for a torn groin muscle. He then then got into just 6 in 1999. Osborne headed to the disabled list in May 1999, his seventh trip there in his career. This time his trip resulted from a shoulder inflammation, according to The Associated Press. "I can pitch through a lot of pain because I've had surgery before and I know what I can and can't do," Osborne explained to The AP. "I can't do it right now. The pain is intolerable." Osborne didn't return for three years. He didn't play at all in 2000 or 2001. He then returned with the Cubs for 2002. He got into 11 games that year, then returned two years later with the Yankees for nine final major league outings. Osborne then continued to play in the minors and independent ball through 2008, last playing with independent Long Island. Osborne has since returned to his native Nevada, where he continues to serve in 2017 as a youth instructor.